The first new nuclear power station to be built in the UK in over 20 years; Hinkley Point C in Somerset will provide low-carbon electricity for around 6 million homes, create thousands of jobs and bring lasting benefits to the UK economy. Marking a significant milestone in the revitalisation of our nuclear power industry, Hinkley Point C will make a major contribution to the UK’s move to reduce carbon emissions. The electricity generated by its two EPR reactors will offset 9 million tonnes of carbon dioxide emissions a year, or 600 million tonnes over its 60-year lifespan. EDF Energy and its partners currently plan to build two power stations in the UK each with two UK-EPR nuclear reactors. They will be at Hinkley Point in Somerset and Sizewell in Suffolk, subject to the relevant consents, permissions and the right investment framework. We are also proposing to develop a new nuclear power station at Bradwell-on-Sea in Essex with the UK HPR1000 reactor technology, again subject to receipt of the relevant consents and permissions. Will there be any further consultation on Hinkley Point C? Formal consultation with the general public and statutory consultees was completed between 2009 and 2011, however we continue to actively engage with the wider community as part of our commitment to local and regional development. We produce regular updates and publications as well as holding community fora and meetings to provide updates and discuss our activities. In October 2013 we reached an in principal agreement with the UK Government on the key commercial terms for an investment contract for Hinkley Point C. In October 2014, the European Commission approved the agreements between EDF Group and the UK Government. The final investment decision and the start of construction took place in the second half of 2016. How can we visit the power station? The Hinkley Point visitor centre, located in Angel Place Shopping Centre in Bridgwater, is open for you to visit between 09.00 and 16.00 Monday to Friday, 09.00 - 13.00 on Saturdays. If you would like to book a tour of Hinkley Point B power station or for more information please contact the Visitor Centre by either telephone or e-mail. Occasional public tours of the Hinkley Point C site can also be arranged through the Hinkley Point visitor centre in Bridgwater, where you can find lots more information about the project. As part of the development of Hinkley Point C we are also planning to build a new public information centre near the main site. How safe is Hinkley Point C? Nuclear safety is our overriding priority and is at the forefront of what we do. Our ambition is to achieve a ‘zero harm’ safety record. As with all of our operational nuclear power stations across the UK, the design basis for Hinkley Point C ensures that the proposed plant is secure against natural hazards that have a frequency of less than one in 10,000 years. These hazards include tides, storm surges and tsunami as isolated and in-combination events. To protect the Hinkley Point C station from such events, the platform level of the site is set at 14.0 metres above sea level, behind a sea wall with a crest level of 13.5 metres. Sea level rise which could result from future climate change has also been considered and an allowance has been made to cover the full 60 year operating lifetime of the new station. Each of our nuclear site stages regular exercises to demonstrate to our regulator the Office for Nuclear Regulation (ONR) that we have appropriate arrangements for dealing with an emergency. The exercises are performed against challenging scenarios agreed with the ONR, and also involve other regulatory bodies, the emergency services, local authorities and central Government. How will you deal with the waste from Hinkley Point C? The new EPR™ reactor design marks significant progress towards sustainability. The reactor has been designed to optimise the use of nuclear fuel and to minimise the production of long-lived high-level radioactive wastes. Thanks to its large core, surrounded by a neutron reflector, a maximum number of neutrons contribute to energy generation in the core. This means that the EPR™ reactor uses less uranium and produces less long-lived radioactive wastes compared with water reactors in operation today. The UK needs to deliver a long-term solution for all its radioactive waste, past and future and not just from the civil nuclear industry but from other industries as well. The UK Government’s solution is the construction of a geological storage facility. The Government’s Managing Radioactive Waste Safely programme is currently working to identify a suitable site for a geological disposal facility to house the UK’s spent fuel and intermediate level waste safely and securely. As a developer of new nuclear power stations, we will play our part by putting in place robust plans to manage the waste and spent fuel that we produce, by decommissioning our plants responsibly and by setting aside adequate funds for these plans. For these reasons, we have established a Funded Decommissioning Programme and are proud to take full responsibility for our power station from beginning to end. To read frequently asked questions regarding the community and local area, please visit Hinkley Point C in the local community. Hinkley Point C will be the first in a new generation of nuclear power stations in the UK. The planned twin unit UK EPR is capable of generating 3,260MW of secure, low carbon electricity for 60 years. Hinkley Point C is one of the largest and most complex projects in Europe and will take 10 years to complete. See how construction is progressing by taking a virtual tour of the site. EDF Energy and British Energy, prior to the merger of the two companies, undertake a series of exhibitions in the local area to explain early plans for a new nuclear power station adjacent to the two existing Hinkley Point power stations. Hinkley Point C was nominated amongst a number of other sites, as part of the Government’s Strategic Siting Assessment, most of which were later designated by the Government as being suitable for nuclear new build. The first formal stage of consultation for Hinkley Point C took place over nine weeks. The initial proposals were presented in a suite of consultation materials. This was the first time that a major nuclear project had undertaken its consultation under the Planning Act 2008 regime. The most detailed stage of formal consultation for Hinkley Point C took place over 12 weeks. The preferred proposals were presented in a suite of consultation materials. The Secretary of State opened the Skills Centre project which EDF Energy committed £3m towards. The project aims to enable people and businesses in the local community to develop the skills they need to secure jobs and contracts at HPC. Hinkley Point C is one of the first major projects to make significant investments at an early stage in skills and education infrastructure. A supplementary stage of formal consultation following Stages 1 and 2, this took place over four weeks and was presented in a few key documents. Contracts worth in excess of £9m had already been awarded to local firms at this early stage of the project. Parliament ratified the National Policy Statement for nuclear, which includes the designation of suitable sites. Both Hinkley Point C and Sizewell C were nominated under the Strategic Siting Assessment process in 2009, which was followed by two separate periods of consultation by the Government. Eight sites were designated as being suitable for new nuclear overall. This permission, granted to EDF Energy to prepare its site for construction, meant Hinkley Point C was the first major infrastructure project under the current planning regime to have such early investment. The site works include fencing and site excavation as well as £30m worth of measures towards mitigating the impact of the project. Consent for the power station itself was received in March 2013. These applications were required to build, commission, operate and decommission HPC. The Nuclear Site Licence application was submitted to the Office for Nuclear Regulation. The Radioactive Substances Regulation, Combustion Activity and Water Discharge Activity environmental permit applications were submitted to the Environment Agency. Consent to build a new power station requires a Development Consent Order (DCO) from the UK Planning Inspectorate and approval by the Secretary of State. The 55000 pages of detailed evidence produced as part of the application was unprecedented. The application was accepted by the Infrastructure Planning Commission on November 24th 2011. Following a detailed four-year review by one of the most rigorous independent nuclear safety authorities in the world, this was a major milestone. The Office of Nuclear Regulation issued an Interim Design Acceptance Confirmation, and the Environment Agency issued an Interim Statement of Design Acceptability, for the EPR Pressurised Water Reactor. The design was fully approved a year later in 2012. Following the decision in 2011 to grant permission for preparatory works, this agreement was signed with West Somerset Council to provide, amongst other things, support for local housing, leisure facilities, transport, and local ecology schemes. West Somerset Community College in Minehead received £1.6 million from EDF Energy to build new training facilities and deliver a range of new courses in order to open up training opportunities for young people, businesses and those seeking to develop new skills. This assists these young and local unemployed people to be prepared for the employment opportunities presented by Hinkley Point C. Find out about our Inspire educational programme. Bridgwater College was given £2 million from EDF Energy to help students and local people secure new skills, training and jobs for Hinkley Point C and to create a legacy of engineering excellence across the South West. The 500 metre-long jetty to be used during the construction of Hinkley Point C will allow significant volumes of construction materials to be delivered by sea, as part of EDF Energy's transport strategy of minimising traffic on local roads. One sea vessel alone avoids up to 250 heavy goods vehicles using the local road network. Permission was given by the Marine Management Organisation and Secretary of State. The Commission presented its opinion to the UK Government, under Article 41 of the European Atomic Energy Community (Euratom) Treaty, concluding that the proposed Hinkley Point C investment "fulfils the objectives of the Euratom Treaty and contributes to develop a sustainable national energy mix." The breakthrough settlement, between EDF Energy, West Somerset, Sedgemoor District and Somerset County Councils, agreed nearly £100 million for local communities to mitigate the impact of Hinkley Point C. This includes the £30m agreed for the preparatory works in Jan 2012. Within the Development Consent Order section 106, more than £64 million was agreed to be spent on supporting local communities and services such as education, training, transport and housing. Visit the community hub for more information on the latest activity. A collaboration between EDF Energy and West Somerset Community College designed to help local students maximise opportunities from the new power station, two new Hinkley Point C training and skills projects were launched at the College at the official opening of its new facilities. Find out more about our Inspire programme for young people. In addition to the 1000 firms, £61 million worth of contracts were also already awarded by this stage across the south west. Find out how to become a supplier. The consultation took place over 11 weeks. The initial proposals were presented in a suite of consultation materials. This Site Licence was the first to be awarded for a new power station in the UK for 25 years. By granting the Site Licence, the UK’s independent nuclear regulator recognised that the new build organisation had developed the required management structure, plans and procedures needed for the construction, commissioning and operation of Hinkley Point C.
The UK EPR (Trademark) design application submitted jointly by EDF Energy and AREVA was the first to successfully complete a thorough examination process in the UK, known as a Generic Design Assessment, by the safety and environmental authorities. It was a major milestone for HPC and meant that there was a stable design before the beginning of construction. These permits govern the rigorous control of emissions and discharges from the proposed power station to ensure that local people and the environment will be protected while the station supplies secure, affordable and clean energy for five million UK homes. The permits were issued following a rigorous decision making process by the Environment Agency started in Summer 2011 and which included extensive public consultation. This decision followed three years of in-depth consultation with local communities and a year long examination by the UK Planning Inspectorate. The approval was met with wide political consensus in the House of Commons. The approval by the Secretary of State meant that Hinkley Point C is the first piece of national infrastructure on this scale to be approved under the new 2008 Planning Act. EDF Energy signed two important labour relations agreements with the GMB, UCATT, Unite and Prospect unions and the main civil engineering contractor Bouygues Laing O’Rourke which addressed the management of industrial relations, as well as pay and conditions. The agreements demonstrated a partnership approach between EDF Energy, unions and contractors and a joint commitment to the success of the proposed project. A big day for the project. Not only did EDF Group and the UK Government reach in principle an agreement on the key commercial terms for an investment contract of the planned Hinkley Point C power station, but confirmation was received that the project will benefit from the Government’s Infrastructure Guarantee Scheme. Also, letters of intent were signed with equity partners, key terms of the four main engineering and construction contracts were agreed, and broad terms for a Funded Decommissioning Programme were also agreed. This followed the signing of similar agreements in June 2013 for civil workers, as well as an overarching agreement establishing the framework for industrial relations for the project. Together, the agreements play their part in EDF Energy's commitment to work together with unions and contractors to create a climate for positive industrial relations which promotes safety, quality and productivity. This Act provides the legislative framework, including CfD’s needed, for delivering secure, affordable, low carbon energy including provisions for attracting investment needed to replace current generating capacity. In October 2013, the UK Government submitted the State Aid notification for the Hinkley Point C investment contract to the European Commission following the announcement of the commercial agreement on key terms with EDF. The Commission made an Opening Decision on the case on 18 December 2013. The Commission undertook a four week consultation on the Opening Decision following its publication in the Official Journal of the European Union (OJEU). At this phase of the project these works help to prepare the site ahead of the main construction following a final investment decision. These initial works include the construction of roundabouts, temporary construction roads and drainage works, all of which are reversible. Visit our community hub to see the planned works. The European Commission approved the agreements between EDF Group and the UK Government to build Hinkley Point C. Its decision followed a rigorous and detailed examination of the deal during a 12 month investigation by the European Commission. For more information see our statement. Energy Minister Rt Hon Matt Hancock MP officially opened Bridgwater College’s Construction Skills and Innovation Centre. The Construction Skills and Innovation Centre is the result of a £1.5million investment from EDF Energy and offers a new civil engineering curriculum including training in excavation, ground works, concrete pouring, formwork and steel, replicating a real life construction site with industry-standard plant, machinery and equipment. The facility will play a crucial role in training the future construction workforce for Hinkley Point C.
A new nuclear skills college announced to train future workers and develop world class skills to meet the skills needs of the growing nuclear industry – including at HPC. The college is a partnership between Government and nuclear employers, led by EDF Energy and Sellafield Ltd, with plans announced for two hubs, one in Somerset and the other in West Cumbria. Education providers for the South-West Hub include Bridgwater College and the University of Bristol. As part of EDF Energy’s work to form a supply chain ready to build Hinkley Point C, the names of further preferred bidders were announced, with combined contract values of more than £1.5billion. Of these, a number of south-west companies, having been encouraged to join forces, created joint ventures to supply site services, transport and accommodation with combined contract values totalling more than £225m. While on a five day tour of China, Chancellor of the Exchequer George Osborne announced an initial government guarantee for Hinkley Point C, provided by Infrastructure UK. The initial deal is set to be worth around £2 billion. As part of ongoing work to develop a supply chain to build Hinkley Point C, EDF Energy announced two further preferred bidder contracts worth over £100m. Rolls-Royce is set to supply heat exchangers in a contract worth over £25m and a Rolls Royce/Nuvia partnership has been selected as the preferred bidder for a contract valued over £75m for the treatment and waste processing of reactor coolant. An important step in the new nuclear programme in the UK, the waste transfer contracts were approved by the European Commission. The contracts are a fundamental element of the Funded Decommissioning Programme which means that the full costs of decommissioning and waste management associated with new nuclear power stations will be set aside by the generator during generation. The cost of this Funded Decommissioning Programme was taken into account in the strike price agreed for Hinkley Point C in October 2013. In the presence of the Chinese President, Xi Jinping, and the British Prime Minister, David Cameron, EDF and China General Nuclear Power Corporation (CGN) signed a Strategic Investment Agreement for joint investment for two EPR reactors at Hinkley Point C. Under this agreement, EDF has a 66.5% share in Hinkley Point C while CGN has 33.5%. The signing also included all contracts between EDF and the UK Government and with key suppliers, all in final agreed form, and the Heads of Terms for the joint development of new nuclear power stations at Sizewell in Suffolk and Bradwell in Essex. Working in partnership with Somerset County Council, district and parish councillors and contractor Aggregate Industries, EDF Energy completes a new bypass to route traffic around the village of Cannington, close to the Hinkley Point C site. The bypass forms part of a £16million package of road improvements which also include new roundabouts on the A39 at Washford Cross and at Sandford Corner and road improvements at Taunton Road / Broadway in Bridgwater. The investment aims to minimise the impact of construction traffic on the local area and provides a permanent lasting legacy from the Hinkley Point C development. Following seven months of productive verbal exchange and sharing of substantial information with employees’ representatives, EDF concludes an official 60-day consultation process with the EDF Company Works Council (CCE). The process demonstrates the company’s commitment to social dialogue. EDF’s Board of Directors make the final investment decision to build two EPR reactors at Hinkley Point in Somerset. The decision provides the EDF President the authorisation to begin the process of signing all the necessary contracts and agreements with the British Government, EDF’s historic partner China General Nuclear Power Generation (CGN) and the main suppliers of the project. Following a review of the Hinkley Point C project, the UK Government confirmed its agreement for the construction of two EPR reactors at Hinkley Point C.
EDF, the UK Government and China General Nuclear (CGN) signed the final contracts for the Hinkley Point C power station in Somerset at a ceremony in London. The signings took place between the Secretary of State for Business, Energy and Industrial Strategy Greg Clark, EDF group Chairman and CEO Jean Bernard-Levy and CGN Chairman He Yu. French Foreign Minister Jean-Marc Ayrault and the Administrator of the Chinese National Energy Administration Nur Bekri also attended the ceremony. The event marks the end of the project’s development phase and formally relaunches new nuclear construction in both the UK and Europe. Bosses at EDF Energy have formally pledged their support to current and former members of the Armed Forces and their families, including reservists, by signing the official Armed Forces Covenant. Nigel Cann, Hinkley Point C’s programme and construction delivery director signed the document on behalf of the company in a special ceremony at the HPC site in Somerset. Colonel James Coote, Commander of HQ South West, co-signed the covenant on behalf of Defence. Six months after contracts were signed for HPC, the first nuclear safety concrete has been poured for the power station galleries. The galleries are a network of connected tunnels which will carry cabling and pipes and will be some of the first permanent structures on the site. We’ve also started construction of a 500m temporary jetty, excavated 3 million cubic meters of rock and soil and commenced work to build our on-site accommodation. Check out our progress film here. Local companies have begun work on a new temporary park and ride site to further minimise traffic movements to and from Hinkley Point C site. A 252-space facility, which will be returned to agricultural use once the power station has been built, is due to be completed by summer 2018. The park and ride will also have parking for motorcycles and bicycles and will mainly be used by people living in the Cannington area, those to the west of Bridgwater and visitors travelling to the construction site. On 29 June 2017 two 12.8 tonne sections of concrete pipe arrived safely at the Hinkley Point C site. These are the first two sections of the CRF pipe infrastructure which will sit in HPC’s deep excavation, below the turbine halls and in between the pump house and outfall buildings, and will channel the cooling water into the power station. The acronym ‘CRF’ stands for ‘Circuit de Refroidissement’ which is the French wording for the Cooling Water Circuit. EDF Energy has awarded Essex firm Ovivo UK Limited a £27million contract to supply the largest cooling water intake screening system in the world for Hinkley Point C; another important step in engaging the UK supply chain. Through its heritage brand Brackett Green®, Ovivo UK Limited will design and supply a complete cooling water intake screening system, processing more than 191 cubic meters per second of water that will be used for cooling both the electricity generating steam-cycle and the EPR technology used at Hinkley Point C.
Ovivo UK estimates that up to 80% of the equipment will be manufactured in the UK. Hinkley Point C project has been recognised for the team’s commitment to health and safety at the 2017 Royal Society for the Prevention of Accidents (RoSPA) awards. The project received a prestigious Gold Medal to mark five consecutive years of achievement in RoSPA’s gold award health and safety scheme. The medal demonstrates that the Hinkley Point C site has well developed occupational health and safety management systems, a positive safety culture and good risk control. Caledonian Modular has begun delivery of a £50m contract for accommodation units for workers at the Hinkley Point C nuclear power station site in Somerset. Caledonian Modular beat international competition to win the contract with Laing O’Rourke and has doubled its workforce and re-launched its apprenticeship scheme to complete the project. The contract guarantees the company 15 months’ work to design and construct the accommodation for the 1,500 workers who will complete the UK’s first new nuclear power station in 20 years. One year since the final contracts were signed and construction is progressing well at Hinkley Point C. Over 2,000 workers are on site every day and 76 apprentices are already working on the project, which will create up to 1,000 apprenticeships during the build. We remain on track to meet the 64% UK supply contribution with nearly £9bn of contracts signed since final approval. Two concrete batching plants are now complete, which means up to 2,000 tonnes of concrete can be produced on site each day. Watch our progress here. Young people aged between 16-21 are being encouraged to sign-up to be part of one of Europe’s biggest construction projects – and they don’t necessarily need to have an interest in building or engineering to apply. Young HPC is designed to help local young people discover the diverse range of job opportunities available to them at the Hinkley Point C project – everything from catering and security to marine work, welding and administration work. And for those who don’t know what their dream job is just yet, there is also plenty of help and advice available to try and find the right role for them. Comprising 724 segments and with a total length of 1.4km, the CRF pipe infrastructure will sit in Hinkley Point C’s deep excavation and will channel the cooling water into the power station. The CRF pipes are 3.5m in diameter at their largest point – which is just a few centimetres narrower than London Underground’s Central line. The installation scope includes setting up the site, erecting the large crawler cranes to install the pipes, provision of pipe supports, welding of steel pipework installation and the final concrete ‘rendering’ of the joints prior to pressure testing. Construction began on the pre-stressing gallery for reactor Unit 1 in February 2018. In late January the platform was formally handed over from Kier BAM to Bylor allowing the permanent civil works to begin. 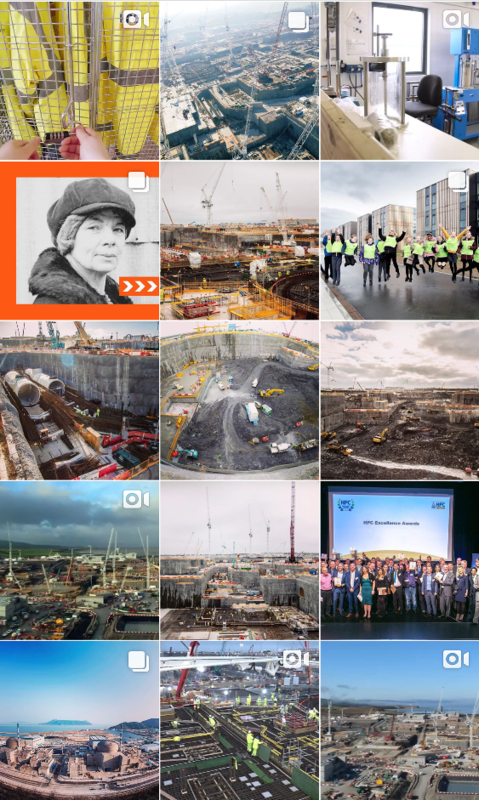 To ready the platform for handover the Kier BAM team excavated an impressive 139,635m3 of material, poured 5,284m3 of concrete (blinding and substation) and installed 1,990 linear metres of soil nails. Now that it has been handed over, Bylor will be responsible for constructing the pre-stressing gallery, which will require 1,608m3 of concrete and over 423,000 kg of steel. The pre-stressing gallery is a circular tunnel structure which sits below the common raft as part of the nuclear island. On 14 March 2018 MPs, Lords and business leaders got the opportunity to see for themselves the economic boost delivered from building a new nuclear power station. They met suppliers and apprentices in Westminster for the launch of a new report detailing the training, skills, jobs and local contracts made possible by the construction of Hinkley Point C.
The report shows that almost 200 apprentices have already started careers at Hinkley Point C, which also provides a schools programme and investment in training facilities. The report also shows that more than £465m of contracts have been awarded in the south-west and that a third of employment opportunities are due to be filled by local people. EDF Energy has committed £20 million to community funds with the ambition of improving the social, economic and environmental wellbeing of communities that are affected by the development of Hinkley Point C’s Nuclear Power Station. On Friday 25 May 2018, Business Secretary, Greg Clark; Energy Minister, Richard Harrington; and French Ambassador, Jean-Pierre Jouyet, visited Hinkley Point C and met some of the 250 apprentices who have worked on the project so far. Hinkley Point C aims to create 1,000 apprenticeships during the construction phase of the project. Hinkley Point C will inject £4 billion into the regional economy over the lifetime of the project. Since it launched in 2011, the Hinkley Point C Inspire Education Programme has carried out over 1,000 activities generating 150,000 student interactions, in over 400 education institutions. The innovative program, delivered in schools across the south-west, is helping to address national skills shortage whilst preparing young people for the wealth of opportunities at Hinkley Point C.
Altrad, Balfour Beatty Bailey, Cavendish Nuclear and Doosan Babcock have joined forces to form the MEH Joint Venture; an innovative partnership between Hinkley Point C and all Tier One MEH and support services contractors. MEH represents the scope of works to be delivered by the joint venture – mechanical, electrical, heating and ventilation. They will work across the Hinkley Point C site to integrate and coordinate the delivery of all main MEH, cabling and associated support services on the project. The joint venture will consolidate these works in line with the project’s priorities of safety, quality, time and cost. This innovative approach will help different contractors work as a single entity to deliver the complex installation of cabling and pipework in the power station’s 2,500 rooms. The first concrete pour for the base of Hinkley Point C’s unit one reactor has been successfully completed. This 4,500 tonne platform provides the stable foundations for the reactor and safety systems. It is made from high quality nuclear concrete, reinforced with steel from South Wales. The first section of 2000m³ of concrete was poured over 30 hours with a maximum thickness of 3.2m. The pour followed approval by the regulator, the Office for Nuclear Regulation. There will be three large tunnel boring machines operating at Hinkley Point C which will be forming the two intake tunnels and one outfall tunnel, for the power station's cooling water system. There will also be one smaller tunnelling kit which will be excavating a tunnel to form the fish return system. As part of its planning application, Hinkley Point C proposed a range of measures to protect fish from the plant’s cooling water system. These include a fish return system, specially designed intakes and an acoustic fish deterrent. Hinkley Point C will install the first two measures but is proposing not to install an acoustic fish deterrent and is asking people for their views in a consultation. The relevant authorities will consider the public’s views when deciding if this proposal is appropriate. Occasional public tours of the Hinkley Point C site can be arranged through the Hinkley Point visitor centre in Bridgwater, where you can find lots more information about the project. As part of the construction of Hinkley Point C, we will be dredging mud and sediment from the seabed off the Hinkley Point C site ahead of the drilling of six vertical shafts for the cooling water system. The cooling water system is a significant piece of infrastructure, which involves tunnelling more than 3km out into the Bristol Channel.